Ethné and Phillipe de Vienne—along with their daughter Marika and son Arik—travel the world sourcing spices. They work directly with farmers, personally selecting the crops they want to sell and bringing them back to their shop. This is their most popular spice blend because it multiplies the flavor of every single dish it touches by a factor or 17 (or thereabouts). 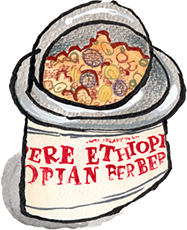 Ethiopian Berbere is a blend of three different chili peppers plus ginger, cardamom, fenugreek, allspice, adjwain (an Indian spice similar to thyme), cassia buds, and black pepper. It’s ideal for seasoning meats, goes great with chicken and blossoms in vegetable dishes. These spices are whole, not ground. Just like with coffee beans, as soon as you grind spices the flavor will fly away. Keeping them whole helps them to last as long as possible at their full potency, with all of their essential and volatile oils at their highest. To use them, just grind them up with a mortar and pestle. It takes less than 60 seconds and the aroma comes up almost as soon as you start grinding.